WonderCon 2016 makes its debut Friday, March 25 at the Los Angeles Convention Center and DC Entertainment wants you to get the first look at some of the exclusives premiering at the show! Co-written with Brian Azzarello with art by Andy Kubert and Klaus Janson, Dark Knight III: The Master Race pits Batman, Carrie Kelley, Superman and Wonder Woman against a renegade priest and his maniacal followers from the newly-restored city of Kandor! The first three issues will be available for sale during WonderCon, each with its own unique variant cover and selling for $15 each. The issue #1 variant cover features art by Howard Porter (Superman, Justice League 3001). Issue #2 features cover art by Jill Thompson, while issue #3 includes a variant cover by Paul Pope. And if you’ve ever wanted your own one of a kind Dark Knight III cover from your favorite Bat-artist, then you’re in luck; Dark Knight III: The Master Race issue #1 will be available for $10, with a blank sketch cover you can take with you to artists’ alley! 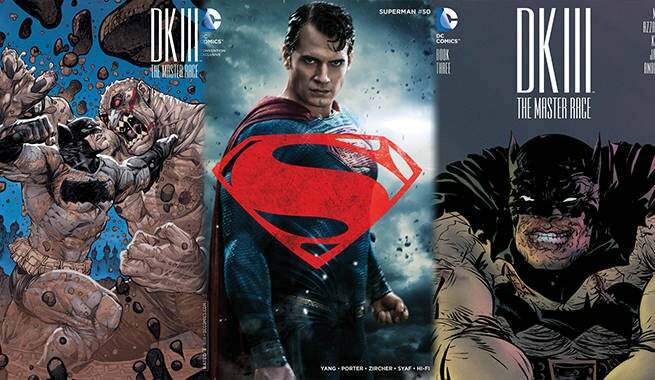 Another series of exclusive variant covers celebrates the upcoming feature film Batman v Superman: Dawn of Justice with variant covers for issues #50 of Superman, Batman, and Wonder Woman. Each sells for $10, and features a photo cover of each of the three principal actors in the film, Henry Cavill (Superman), Ben Affleck (Batman) and Gal Gadot (Wonder Woman). WonderCon 2016 takes place March 25-27 at the Los Angeles Convention Center in Los Angeles, California. Stay up to date on all things DC Entertainment by downloading the all-new DC Entertainment app on the Apple App Store or the Google Play Store. And be sure and stop by the DC Entertainment booth in South Hall (#1602) to meet some of your favorite writers and artists! Check out the variant covers, exclusively available at WonderCon 2016, in the gallery below! Batman v. Superman: Dawn of Justice hits theaters March 25.